If you are interested in how to manage creative people to maximize your innovation potential, here is a book to read over the holidays. Or give to you boss as a (hint) gift. Lina Echeverria is a leadership consultant with over 25 years experience in science and technology. At Corning, Lina went from scientist to Vice-President and tended both people and process that resulted in products ranging from faster optic fibre to flat-panel glass used in smart-phones and LCD TVs. Her emphasis is on culture that is defined by beliefs, attitudes, energy, interaction styles and rituals. Her focus is on the values that drive creative engagement. I love her commitment to establishing an oral tradition – the stories told that drive passion and respect individual freedom to create in a space that authentically welcomes innovators. A yummy, yummy book hot off the press! It’s been a busy Fall! From classes starting again and working with the Conference Board here in Canada, I’ve been running. At our last meeting of the Customer Experience Council, we had the pleasure of listening to a presentation on VRM – Vendor Relationship Management – by Doc Searles. Searles has done it again. From the Cluetrain Manifesto and ‘all markets are conversations’ to ‘caveat venditor‘ – let the seller beware. Customers are beginning to take charge of their own data, maybe not tomorrow but its coming. The market is shifting to being driven by demand – the customer. Beyond customer-centric, The Intention Economy shows us a world ruled by customer intent – vendors must respond to the intentions of the customer instead of responding to a crowd. Consider a world where you were able to build your own loyalty programs and dictate terms of service to the vendors that you favor? Control the flow and the usage of your personal data? Once again, the message is ‘The end of business as usual’. Big data gives you big data. Insight into the marketplace is what is required. VRM is forerunner of what is to come. 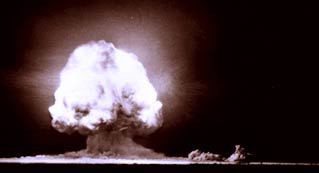 Today is the 67th anniversary of the first successful atomic explosion, in the in section of the southern New Mexico desert known as Jornada del Muerto, “Journey of the Dead Man,” or more precisely, day’s journey through the landscape of death. 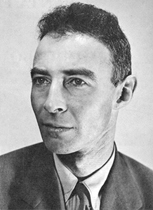 J. Robert Oppenheimer, public domain. The quotation from the Gita was a retrospective word-shaping during an interview afterwards, perhaps the only way for this erudite man to express the power of the singular experience. That these words were uttered in the Jornada del Muerto is now a modern-era myth — and an apt one. Making myths is an ongoing human psychic activity, and has a name: mythopoiesis, meaning “myth-making.” The more exact etymology to the Greek words from which the term was coined in the 19th century would be: “mouth-making” — the creation of inspired, memorable and therefore powerful words. All of the ancient Vedas are about powerful word-making, the poetry of creation and, even before eyes were present to see, about the powerful primacy of sound, of vibration, of energy waves. Virat Swarup is the Sanskrit term meaning, “divine appearance of the god, in unimaginable power.” It appears in the Bhagavad Gita, which is a long dialogue between the hero Arjuna and his charioteer and friend, Krishna, who is an avatar of the supreme god Vishnu, who is both world-creator and destroyer. Arjuna is tired of so much death, and is questioning the ethics of his participation in the continued and seemingly endless killing in the long and bloody family war that is the center of the massive epic Mahabharata. At the climax of their extended dialogue, Krishna reveals himself in his exalted god-form, the Virat Swarup. It is Krishna who speaks the words that Oppenheimer remembered, then or later, as the only words that could express his experience. The message that Krishna conveys to Arjuna in the Gita is that we all have the responsibility to act in accordance with our gifts — Arjuna was the best killer — within the context of the unimaginably huge tapestry wherein which each of our destinies is but a single yet significant thread. Consider too, that mythopoeisis — the creation of new myths — is divinely inspired as well. Nor is Arjuna’s story quite so simple as his decision, in that moment, to honor the commitment to kill, for now, and to honor the logic of that particular talent. Arjuna’s story was not complete, and ultimately, he chose a different ending. Nor is any of our stories quite so simple, nor, for now at least, at an end. And, we can choose how we commit to continue, or alter, it. And, how we wish it to end.